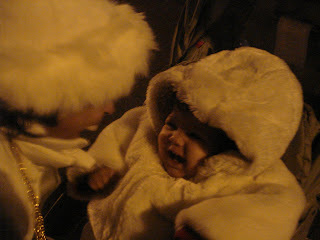 We thought that Zoe would love to see the Celebration of Lights parade, so we went downtown to see all of the action. Zoe had a great time! All of the kids that were in front of us were running out and getting her candy, beads, and toys that were being thrown from the float. She also seemed to think that she was the parade because as we strolled her down the street she was sitting up and waving to everyone saying "Hi, Hi, Hi." It was too cute! 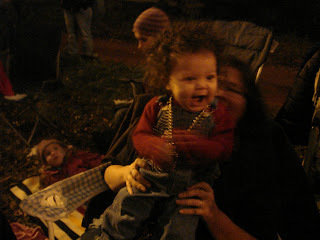 Her favorite part of the parade was the fire truck when it came down the street with the lights and siren on. After the parade was over, we went to see the Enchanted Forest and the Celebration Village and we found Grandma. 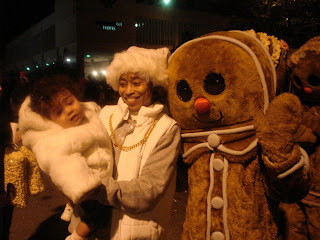 She wanted to take pictures with Zoe and the Gingerbread Men but Zoe wasn't really digging them. We walked downtown a little more to one of the musical stages and Zoe and Grandma got to dance in the street.